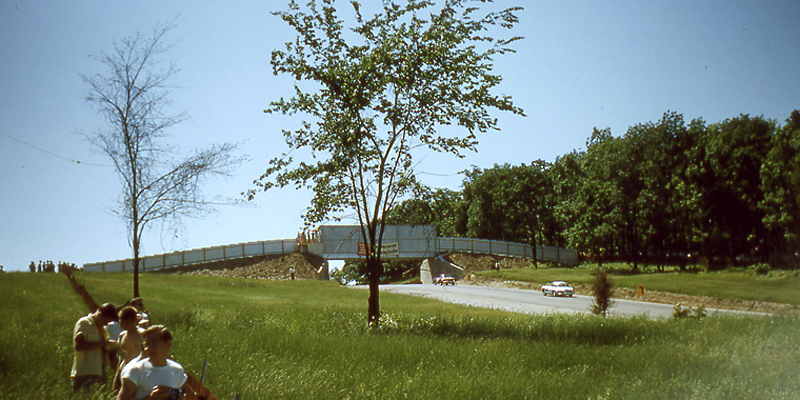 The pedestrian crossover bridge on Fireman's Hill was built in 1956, one year after the track opened. It is still the gateway leading into turn 6, a sharp blind curve that must be anticipated by drivers. Cars exiting turn 5 thunder up the hill at full throttle and hit the brakes right before or at the bridge where the entry begins at turn 6. 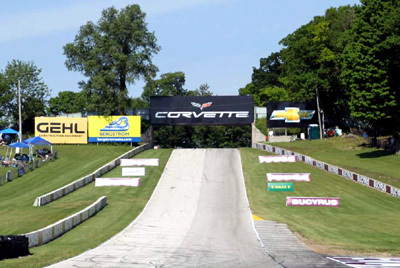 The bridge is another Road America landmark and has displayed several different corporate sponsors over the years, most notably Corvette. Other sponsors to follow were Toyota and Nissan. But, it continued to be referred to as "Corvette bridge" even when it wasn't. The name has long been adopted by the legions of race fans, drivers and track officials. 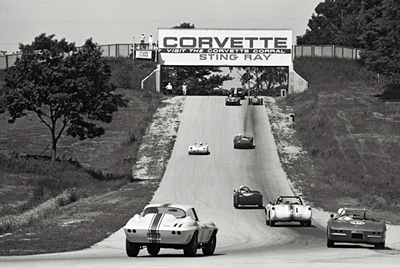 First race on the new Road America course in September 11, 1955. 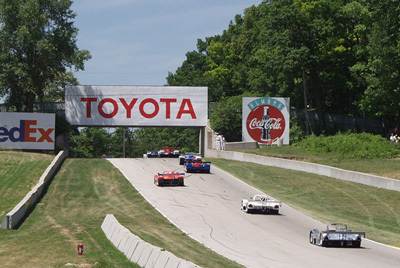 Cars race toward Turn 6 beyond the top of Fireman's Hill. 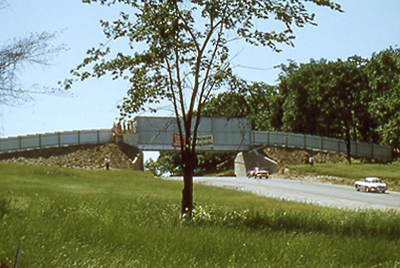 The pedestrian crossover was built on the hillcrest the following year and became know as Corvette bridge. 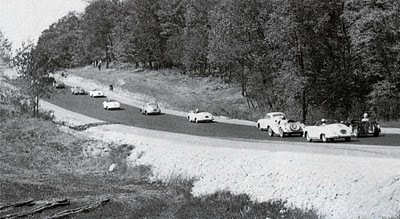 (ABOVE) Cars from a small production class are racing up the hill to turn six, before the crossover bridge was built. Fireman's Hill has not been cleared for spectator viewing. Also absent are any guardrails or hay bales to stop a wayward car from flying into trees. 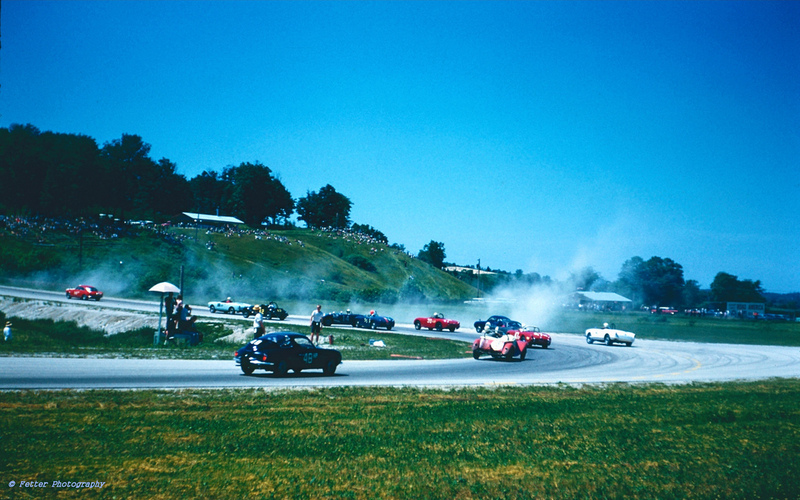 The photo was taken of race four during the SCCA National Sports Car Championship on Sunday, September 11, 1955. Bob Ballenger #14 drove a Porsche 356 in F-class production and won the 45-minute race with an average speed of 67.7 mph. The bridge wasn't built until the following year in 1956. The newly completed bridge at turn 6. You can see the embankment was recently filled. The bridge is sided with vertical corrugated aluminum panels. 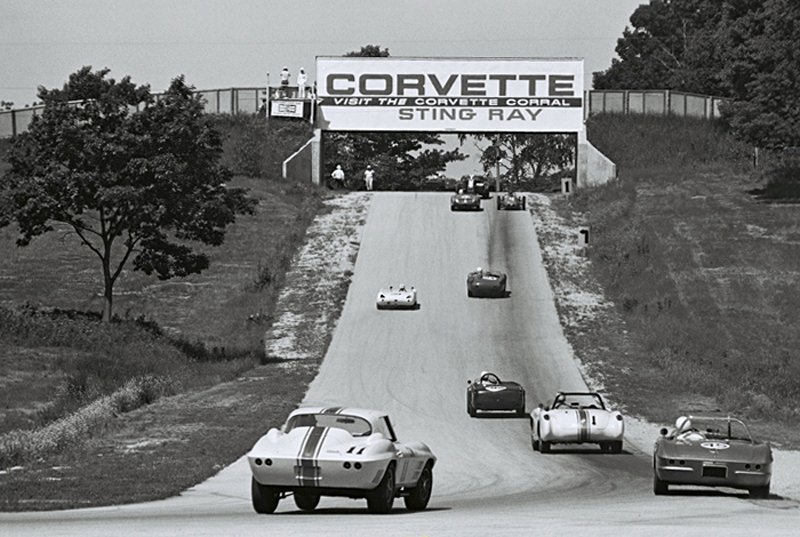 It was also the inaugural year for the annual June Sprints SCCA National Road Races on June 20-24, 1956. 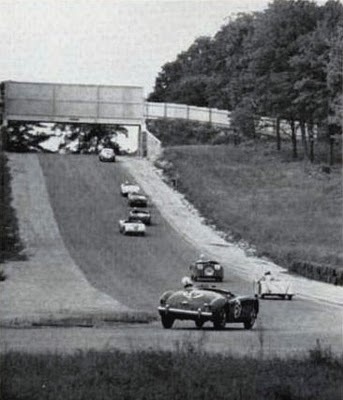 Another view of the bridge during the SCCA National Championship 4-hour endurance race on Saturday, September 8, 1956. Hay bails line the edge of the track at turns. 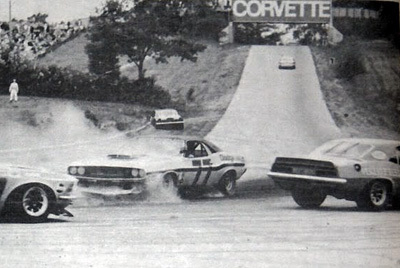 They were thought to offer good protection to drivers on off-course excursions, but tended to flip cars. 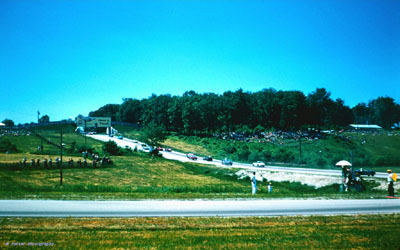 (ABOVE) Cars exiting turn 5 are charging the hill up to the bridge, and then brake for turn 6, which suddenly appears to drivers. The corner bends sharp to the left before the trees, seen in the background beyond the bridge. The covered bridge has fencing on the approaches at both ends. This is to keep spectators from getting to close to the track's "hot" areas. The bridge has essentially remained the same all these years and is an icon of the track. View (looking west) from camera with Briggs Cunningham driving a C-Modified Lister Jaguar #62. The car is charging up the hill toward T 6 beyond the bridge on Fireman's Hill. 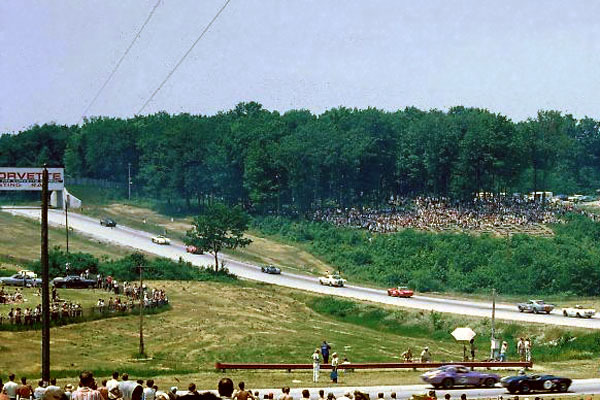 The Road America 500 - September 10-11, 1960. 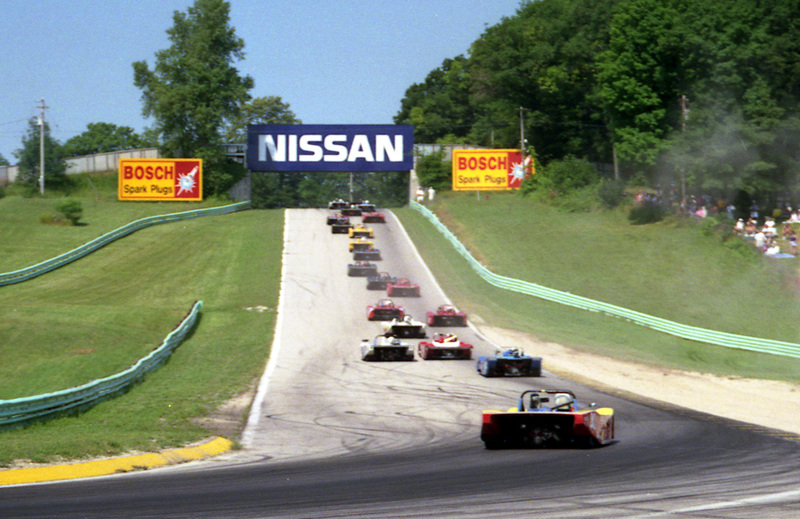 Part of what gives Road America its natural charm is the Wisconsin Kettle Moraine landscape of rolling hills, trees and grass knolls all situated on the 640 acre site. The lush landscape, roar of cars, smells of grilled brats and roasted corn all present a unique ambiance. Clif Tufte's remarkable creation of the 4-mile circuit followed the natural topography and transformed the site into an enchanted forest of sorts. 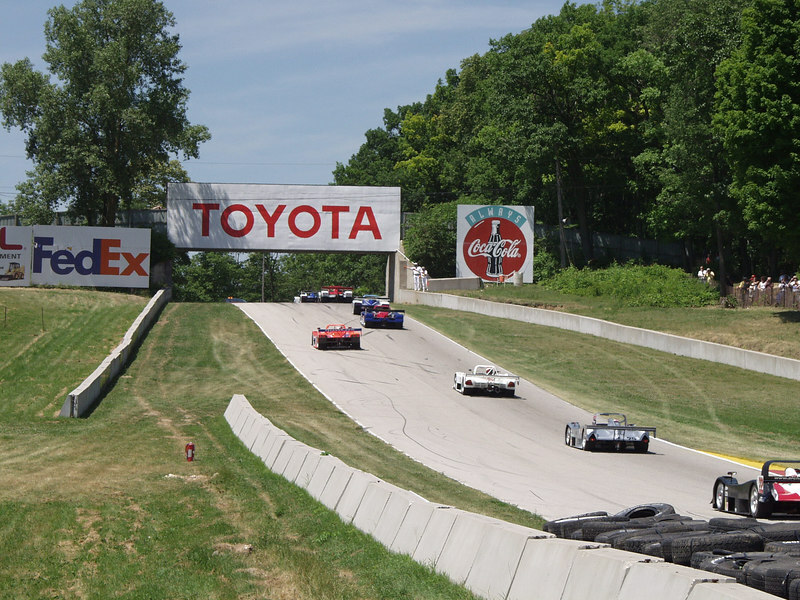 The world-class road circuit is truly one of Wisconsin's hidden wonders and is revered by motorsport professionals and fans alike. The photo (above) is a wider view taken outside of Turn 5 during the 1961 June Sprints SCCA National. The race group includes F, G, and H Production cars. The crossover pedestrian bridge in the background was adorned by Pepsi advertisement and slogan, "Have a Pepsi." It later became known as Corvette Bridge when the sponsor changed. 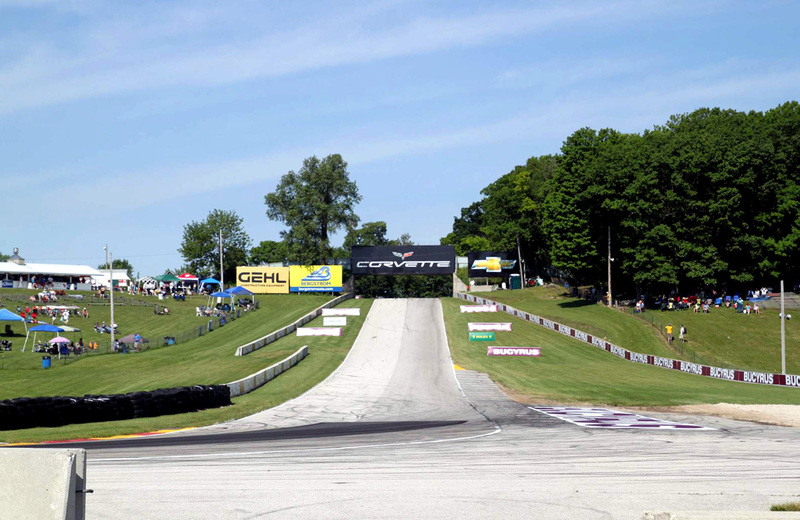 This is Turn 5; the small building on Fireman's Hill is one of several concession stands around the Road America grounds and 4-mile course. Brats, burgers, corn-on-the-cob and beer are served. Turn 5 area has an excellent vantage point where cars brake the hardest. There is an aroma of outdoor food as well as heated brakes. Production cars rounding Turn 5 heading uphill to Corvette Bridge and Turn 9 beyond. 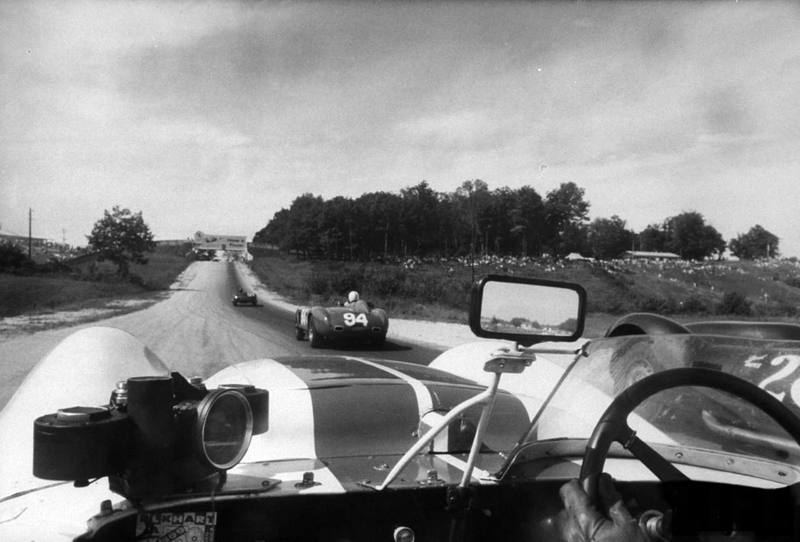 Looking west during the 1963 June Sprints SCCA National. A color photo of same Corvette bridge marquee two-years later. 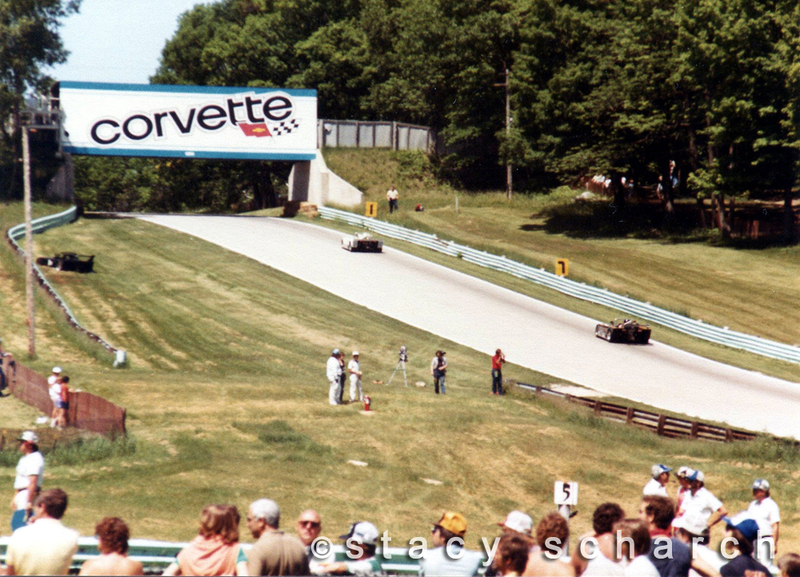 Production cars enter and exit Turn 5 (out of view at right) heading uphill to Corvette Bridge. The view is looking northwest during the 1965 June Sprints SCCA National. (ABOVE) A crowd of spectators is seated across the track on wood benches at Fireman's Hill. Ten years previously, trees occupied what is now a popular viewing area, which also has it's own concession stand. The second-generation Corvette sign first appeared in 1970. 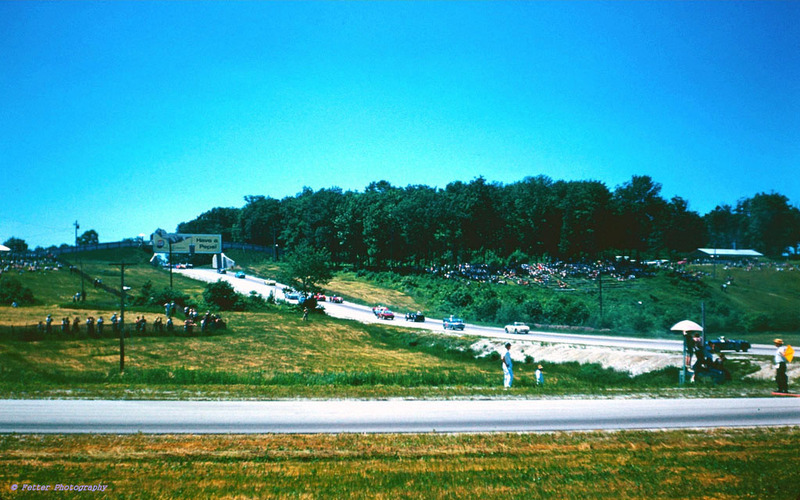 Photo is looking west from Turn 5 at spin action during SCCA Tran-Am, Over-2-Litre, race on Sunday, July 19, 1970. 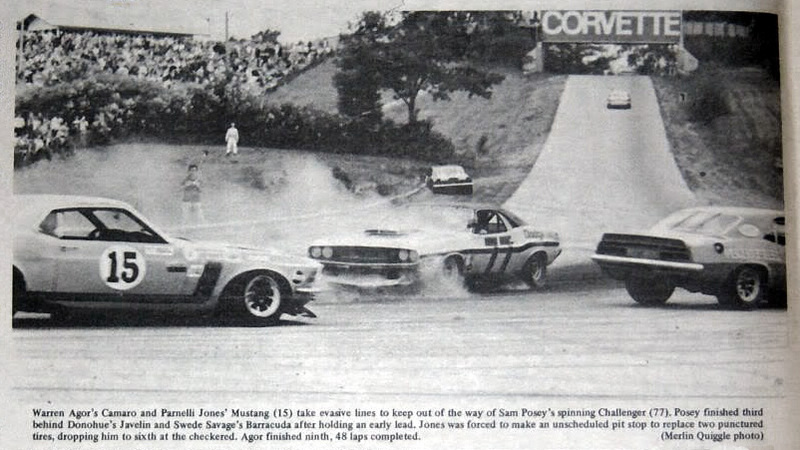 Cars from left: Parnelli Jones #15 Mustang, Sam Posey #77 Challenger and Warren Agor #13 Camaro. 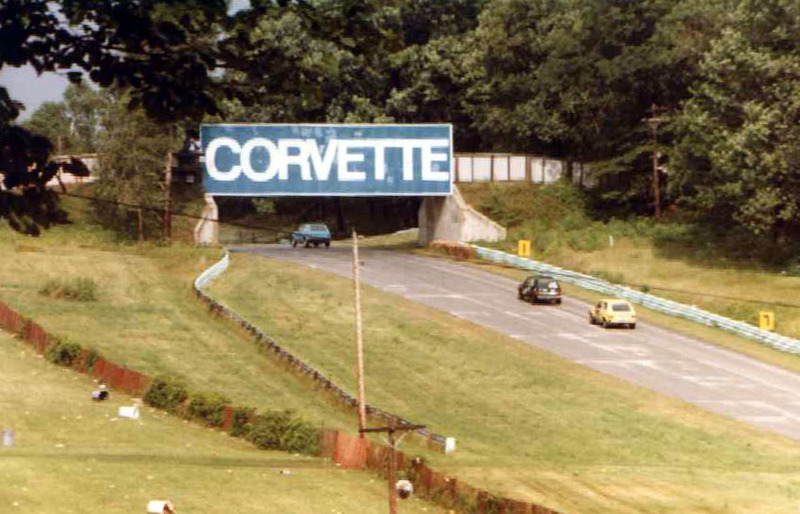 The bridge saw an updated version of the Corvette marquee applied to the siding about 1971. It remained in place for a decade but was beginning to fade (as seen above) during its last season in 1981. The third Corvette bridge title was an improvement over the previous two-tone block letter version. Fans were glad to see the improvement and new graphics, however the marquee only lasted for one-year. Fans were greatly disappointed the following year when the Corvette name disappeared and was replaced by Nissan in 1983. 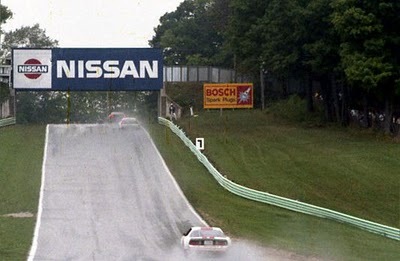 This was the first of two Nissan bridge marquees. It was applied in 1983 and included a Datsun-like logo on left. Also, other advertising began to accompany the bridge marquee. Photo taken during Kelly American Challenge weekend of August 24, 1985. By 1983, it was becoming evident that the track was interested in more corporate sponsorship to finance increasing costs of track operation. 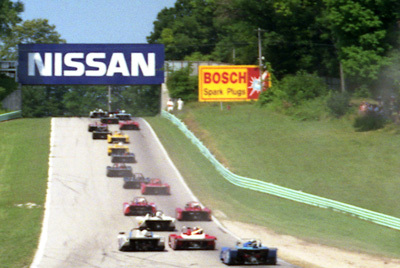 The bridge at turn 6 also became the target of additional trackside advertising. This calls into memory The Highway Beautification Act of 1965 passed by Congress, spurred by the wife of then President Johnson. You begin to wonder if there's a distraction factor for drivers pushing their cars to the absolute edge. 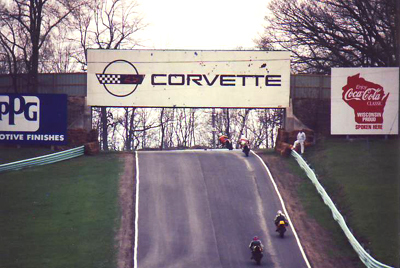 Fourth Corvette marquee at turn 6 bridge on Fireman's Hill existed from 1992 through 1995. You can also see the aqua colored Armco steel guardrail on both side of the track. The Corvette bridge reappeared in 1992, somewhat reminiscent of the original Corvette bannering. 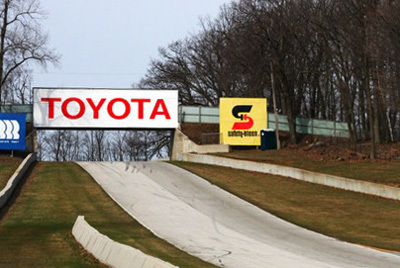 It saw four seasons then was replaced by new corporate sponsor Toyota in 1996. The Corvette name eventually returned again. Toyota badge saw fifteen seasons between 1996 and 2010. Photo taken Wednesday, March 24, 2010 during a NASCAR Nationwide Series test day. The bridge's concrete abutment stem and wing walls are original to the 1956 construction. About the only thing that has changed are the vegetation and the presence of barrier walls and additional advertising boards. The fifth Corvette bridge marquee at Fireman's Hill in 2011. 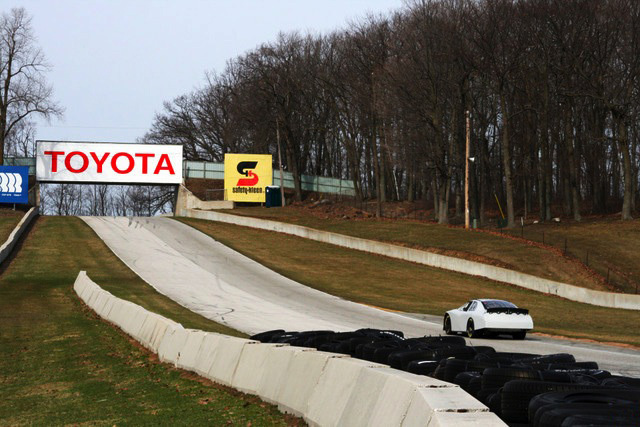 The stretch between turns 5 and 6is bombarded with advertising along the track edge. So much for the beauty of the track's landscape and the appearance of safety. 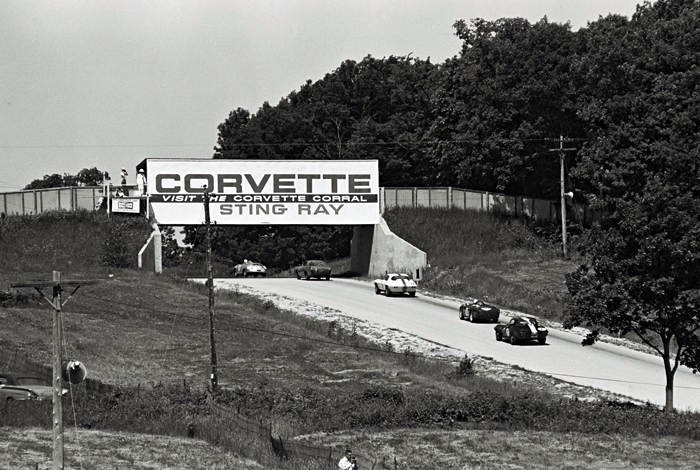 Corvette Bridge has long been a signature landmark among the others at Road America. 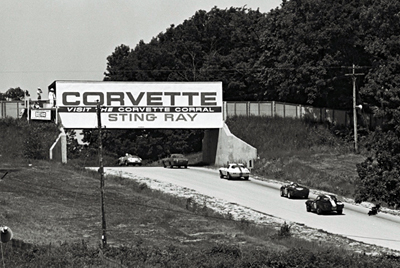 Even under a different name, you couldn't quite get racing enthusiasts to stop referring to it as Corvette bridge. On August 21, 2011, it was given a proper re-dedication ceremony as Corvette Bridge. It was the fifth time America's legendary sports car made the crossovers marquee. It is king of the hill once again, and said to be a permanent designation. Only time will tell.